The musculus rectus abdominis probably is one of the most popular muscles of the human body. Not only is this muscle responsible for the very desirable six pack shape of the stomach. It also plays an important role in protecting our organs and stabilizing the pelvis and spine. A well pronounced ab musculature has many positive effects. The musculus rectus abdominis represents the straight abdominal muscle. It originates from the fifth till the seventh rib, where it is attached to the cartilage, and the xiphoid process of the sternum (breastbone). From here it covers the entire stomach down to the pelvis where it inserts the pubic bone. A fibrous structure of connective tissue (linea alba) divides the musculus rectus abdominis into two parts horizontally from the top to the bottom. Three to five additional vertical tendons separate the straight abdominal muscle into smaller parts. This structure is quite popular and commonly referred to as four, six or eight pack which becomes externally visible with a low body fat percentage and a well trained abdomen. Together with the obliques the straight abdominal muscle allows us to keep a correct body posture. The abdominals and the muscles of the lower back represent the muscle corset of the trunk. They stabilize and relieve the spine by keeping the pelvis from tilting too extensively. This prevents a hollow back what puts less strains on the intervertebral discs. The workout of the musculus rectus abdominis is essential. To fulfill all muscle functions a well-pronounced musculature is required. There are numerous exercises for the abdominal muscles. Please note that all abdominal exercises train all parts of the abdominals, including the obliques. But we can emphasize the different parts by choosing the respective exercises what allows us to focus on certain areas within our workout. The straight abdominal crunch, straight leg lifts, and straight plank versions especially emphasize the straight abdominal muscle. Please do not forget about the antagonist of the abdominals. Solely a good balance between the abdominal and the back muscles can ensure an optimal functionality. Muscle training gives the body a desirable shape. Unfortunately, it is not possible to reduce fat selectively in desired areas of the body. If we want to have our abdominal muscles visible we have to reduce fat throughout the entire body (see muscle definition). Furthermore, regular ab exercises are important for the statics of pelvis and spine as well as for an optimal performance level in almost all sports. When we work out our abdominals we often tend to press breathing (exhalation against closed airways). This is due to the isometric parts of the exercises. Especially older people and people with complaints of the cardiovascular system should avoid press breathing. Breathe out in phases of strong muscle tension and take short panting-like breaths in static phases. Almost all exercises for the musculus rectus abdominis activate the hip flexors musculus iliopsoas and musculus rectus femoris as well. 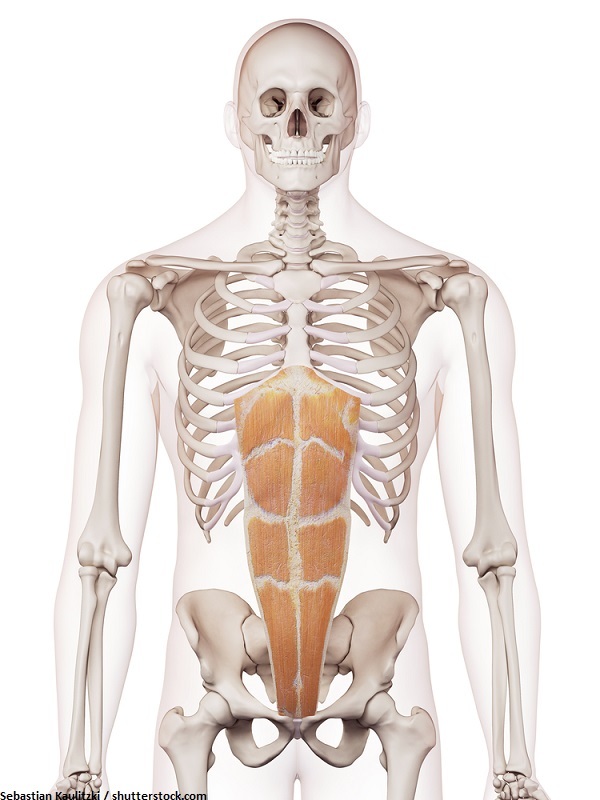 Whereas the abdominals erect the pelvis, the hip flexors tilt the pelvis what causes a hollow back. But the activation of the hip flexors reinforces the training for the ab muscles, that have to work against the tilting force of the hip flexors on the pelvis. As long as the rectus abdominis is able to compensate the force of the hip flexors, the exercise can be performed properly. As soon as the force of the hip flexors begins to outweigh the abdominals, the exercise should be switched to an easier form or aborted. This typically applies for exercises, like straight leg lifts and intense versions of the crunch (bicycle crunch, sit-ups with fixed legs, etc.) and the plank (front plank, crouching hover plank). The musculus rectus abdominis is very important for the posture of the body and stabilizes the pelvis and the spine. Also, huge importance can be attached to the straight abdominal muscle in terms of esthetics. When you work out your abs you shouldn’t forget its antagonist, the muscles of the lower back. Please follow the links to find exercises for the rectus abdominis as well as to get an overview of all abdominal muscles.